There’s no doubt about it, video is the media du jour. YouTube is a billion dollar platform, and Facebook and Instagram stories have soared to new heights. Have you started using video to build your brand? Animoto video maker is an awesome tool to have in your corner if you’re looking to grow your business. Keep reading to learn how to make a promotional video in 4 easy steps. 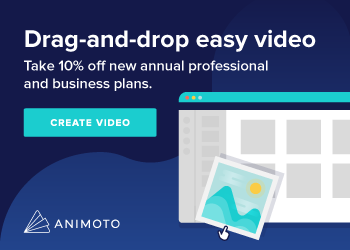 Animoto is a great photo presentation tool whether you’re creating videos or slideshows to market your business, showcase your photography portfolio, or share compelling media with friends and family. It’s also pretty amazing for educators who want to make tutorials in an easy-to-understand format. 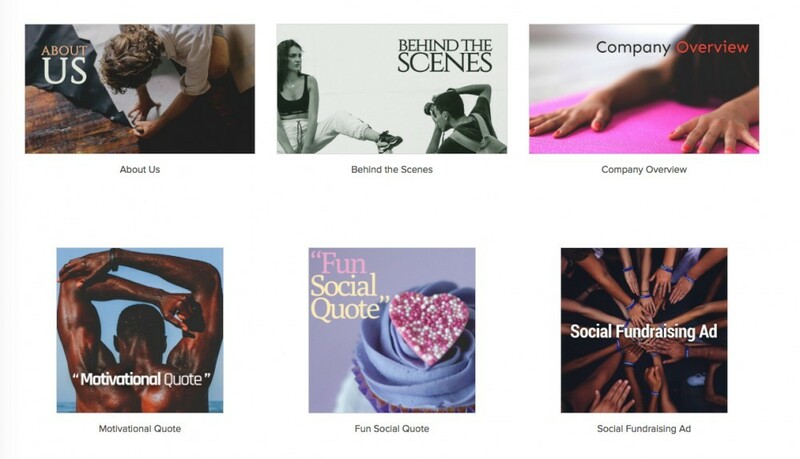 Animoto has something for everyone. Creating videos is quick and easy, all you have to do is drag and drop videos and/or images into Animoto’s pre-built templates, add some text, some toe-tapping music, and you’re off to the races. And don’t worry, no video editing skills are required. Once your video is produced, all it takes is one simple click to share your incredible creation with your tribe. Videos are great marketing tools to engage your audience on social media, and drive traffic to your website. Since online businesses can’t grow without a steady stream of traffic, finding effective marketing strategies to further this goal is essential. Creating short videos in Animoto can help you boost brand awareness, helping you grow your business. Have you ever thought of using videos to promote the products and services you’re selling, or to create engagement around your content? There are tons of different applications when it comes to video creation, use them to promote, educate, showcase, and entertain. At their core, videos are a great avenue in which to tell your story, whatever your story may be. Create video ads or promotions, social media marketing videos for Instagram, Facebook, and YouTube, or full out professional videos. Over 1 million stock photos and videos from Getty Images are available, which you’ll have exclusive access to when you sign up for a Professional or Business plan. Choose a font you love and customize the size and placement of your text to create colorful and engaging titles. Make your videos even more watch-worthy by adding music from Animoto’s vast library of pre-licensed songs, and because all videos are hosted in the cloud, you can conveniently email your videos or share them to social media and YouTube. Videos for your Facebook feed: Showcase projects you’re working, online courses you’ve created, or share the highlights of your latest vacation. YouTube Ads: Promote your products and services by making ads for YouTube. Tutorials on Instagram: Animoto is great for making short tutorials to share on your Instagram stories. Video Advertisements: Promote whatever it is you’re selling by creating a promotional video or slideshow. Product Demos: Detail the features of one of your products or a breakdown of a service you’re providing. Behind-The-Scenes Videos: This genre works well for artists and photographers who want to share their images or real estate agents who want to show current properties on the market. Product Testimonials: Share what people are saying about a particular product you’re invested in or reviewing. 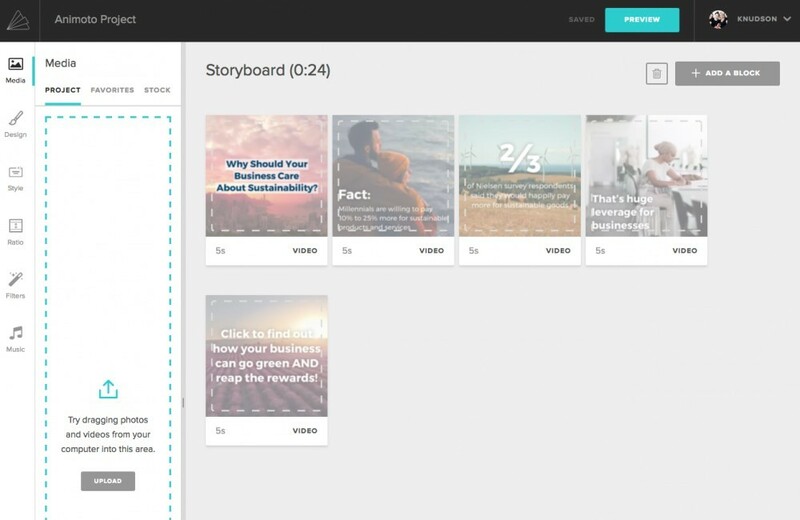 Share-A-Story Videos: Visually outline an overview of your company. Anniversaries: Surprise your husband with a meaningful anniversary slideshow or your parents with a fun-filled video for their Golden wedding anniversary. Birthdays: Share snippets of your two-year-old on their special day or go all out for your grandma’s 90th birthday party, sharing photos and video that document her life. Weddings: Create save-the-date, engagement, bridal, or wedding videos to share highlights of your wedding celebration. Fundraiser Videos: Trying to raise money for a worthy cause? Share images of the people you’re trying to help. Motivational Quote Slideshows: Share motivational quotes, along with beautiful images in a slideshow format. About Us Videos: Highlight features of a new company or product launch. I’d like to walk you through a visual tutorial of how to create a video in Animoto. In this tutorial, I’ll be making a promotional video for my affiliate marketing business. 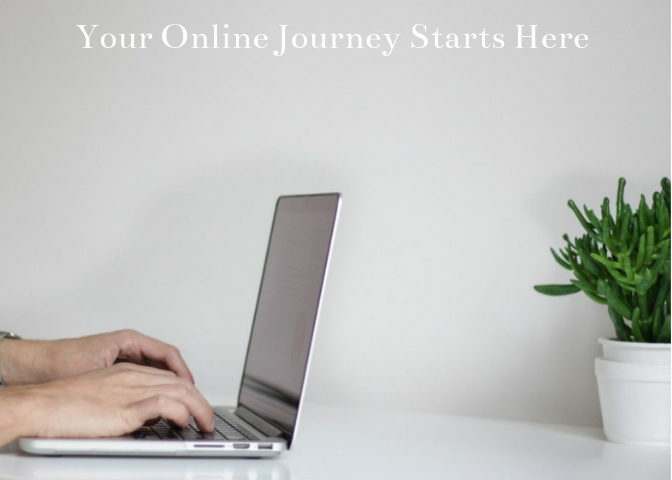 If you’re interested, read my review here of how I got started online. 1. Go to Animoto.com and create an account. 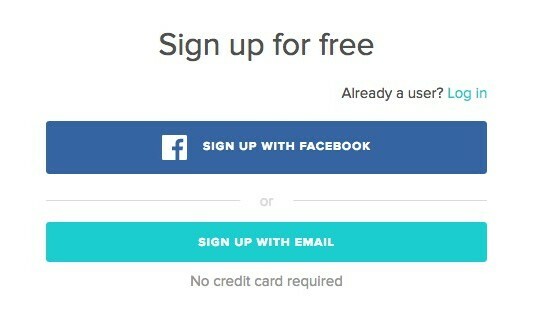 You can quickly sign up with your Facebook account or use your email to sign up. Now click the aqua-colored “Create” button. 2. Go ahead and choose a template. I’m going to choose a template from “Attract An Audience.” I’m settling on the “Industry Insights” template because I want to summarize the features of an online certification course I’m a member of. I also want to end the video with a call-to-action that will hopefully drive traffic to my website. Animoto videos are designed using blocks. Add or delete blocks by clicking the gray “Add A Block” button. 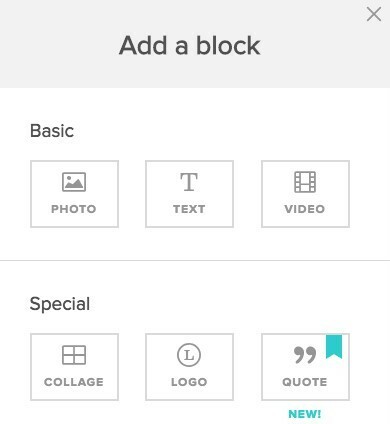 Start adding media and customizing your video by clicking “Edit” underneath each block. Keep in mind, you can always preview your video at any time by clicking the “Preview” button in the top, righthand corner. Add photos, videos, collages, logos, text, and even a quote, which is a new feature I’m enjoying. The editor is drag-and-drop so it’s simple to drag your blocks in the order you want them. You can drag photos and videos from your computer directly into the editor as well. And don’t forget to choose the size and color of your text, along with the font under the “Design” tab. You can see I’ve added a photo, logo, and quote block. The “Ratio” icon let’s you change the aspect ratio of your video to either landscape or square, and you can further customize your video by experimenting with the different filters. Under each block, you’ll see icons where you can add text, or media, and you’ll also have the ability to record. 4. 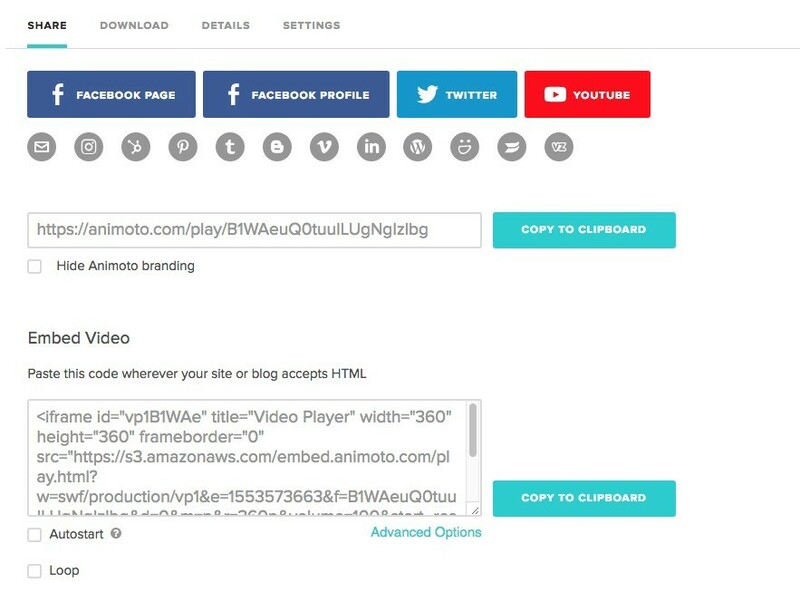 After you’ve finished customizing your video, click “Produce.” You’ll then be taken to this screen where you can share your video to social media or embed your video using HTML. Animoto offers a free trial and you won’t have to enter your credit card information to get started. Try it out for a month and get a feel for how it works. 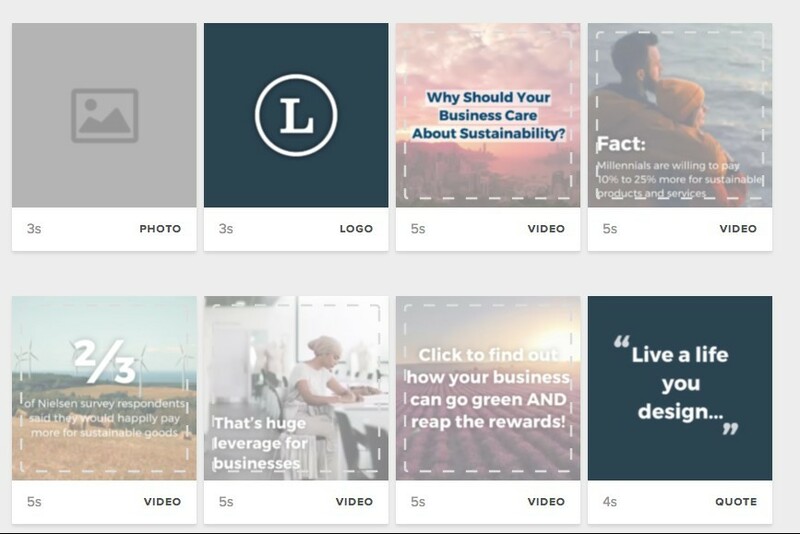 You’ll be able to create 30-second videos with your free account, which is awesome for creating social media stories, product reviews, and company overviews. Following your trial, you can decide which premium account best fits your needs. Animoto has three pricing packages and you can choose between a monthly or a yearly plan. See the yearly prices below. You can get started with a Personal account for just $8.00 a month. The Professional and Business plans offer additional storyboards, fonts, custom colors, photos, videos and music. With each plan, you won’t be limited to then number of videos you can make, and all videos will be free of watermarks. You’ll also be able to download your videos and share them to social media, and of course you’ll have access to Animoto’s music library. It’s a lot of fun making videos with Animoto. I like making promotional videos to market my business, but you can also create video ads, product testimonials, tutorials, or behind-the-scene videos. The possibilities really are endless, just use your creativity and imagination. Create your account here to begin making your own amazing videos.